True story: one way that I commit large numbers to (hopefully) short-term memory is by factoring. 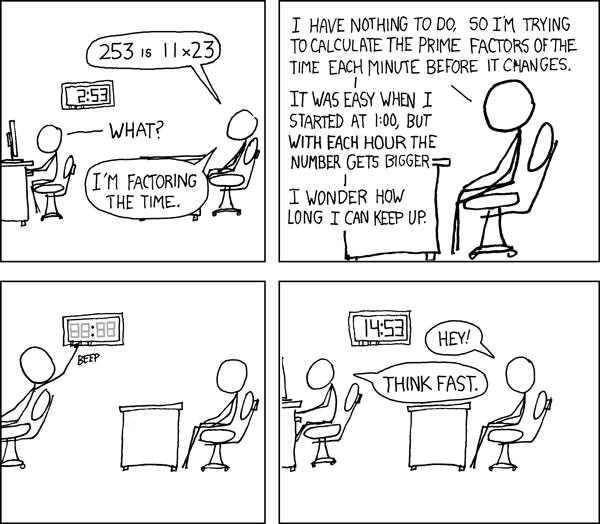 If I take the time to factor a big number, then I can usually remember it for a little while. This approach has occasional disadvantages. For example, I now have stuck in my brain the completely useless information that, many years ago, my seat at a Texas Rangers ballgame was somewhere in Section 336 (which is ). This student submission again comes from my former student Caitlin Kirk. Her topic, from Pre-Algebra: introducing variables and expressions. To keep track of some of the coldest things in the universe, scientist use the Kelvin temperature scale that begins at 0 Kelvin, or Absolute Zero. Nothing can ever be colder than Absolute Zero because at this temperature, all motion stops. The table below shows some typical temperatures of different systems in the universe. You are probably already familiar with the Celsius (C) and Fahrenheit (F) temperature scales. The two formulas below show how to switch from degrees-C to degrees-F. Problem 4: Two scientists measure the daytime temperature of the moon using two different instruments. 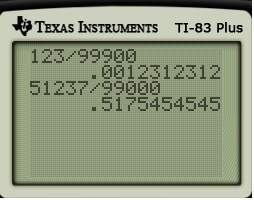 The first instrument gives a reading of +107 C while the second instrument gives +221 F.
a. What are the equivalent temperatures on the Kelvin scale? b. What is the average daytime temperature on the Kelvin scale? Problem 5: Humans can survive without protective clothing in temperatures ranging from 0 F to 130 F. In what, if any, locations from the table above can humans survive? 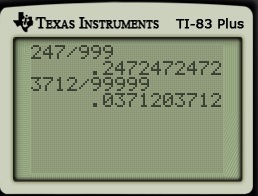 Problem 1: First convert to C: C = 5/9 (212-32) = +100 C. Then convert from C to K: K = 273 + 100 = 373 Kelvin. Problem 2: First convert to Celsius: 0 = 273 + C so C = -273. Then convert from C to F: F = 9/5 (-273) + 32 = -459 Fahrenheit. Problem 3: K = 273 – 100 = 173 Kelvin. a. 107 C becomes K = 273 + 107 = 380 Kelvin. 221 F becomes C = 5/9(221-32) = 105 C, and so K = 273 + 105 = 378 Kelvin. First convert 0 F and 130 F to Celsius so that the conversion to Kelvin is quicker. 0 F becomes C = 5/9(0-32) = -18 C (rounded to the nearest degree) and 130 F becomes C = 5/9 (130-32) = 54 C (rounded to the nearest degree). Next, convert -18 C and 54 C to Kelvin. -18 C becomes K = 273-18 = 255 and 54 C becomes k = 273 + 54 = 327 K.
None of the locations on the table have temperatures between 255 K and 327 K, therefore humans could not survive in any of these space locations. A. How can this topic be used in your students’ future courses in mathematics or science? This topic is one of the first experiences students have with algebra. Since algebra is the point from which students dive into more advanced mathematics, this topic will be used in many different areas of future mathematics. After mastering the use of one variable, with the basic operations of addition, subtraction, multiplication, and division, students will be introduced to the use of more than one variable. They may be asked to calculate the area of a solid whose perimeter is given and whose side lengths are unknown variables. Or in a more advanced setting, they may be asked to calculate how much money will be in a bank account after five years of interest compounded continuously. In fact, the use of variables is present and important in every mathematics class from Algebra I through Calculus and beyond. There very well may never be a day in a mathematics students’ life where they will not see a variable after variables have been introduced. In basic arithmetic, probably in elementary or early middle school math classes, students learn how to do calculations with numbers using the four basic operations of addition, subtraction, multiplication and division. They also learn simple applications of these basic operations by calculating the area and perimeter of a rectangle, for example. Introducing variables and expressions is a continuation of those same ideas except that one or more of the numbers is now an unknown variable. Students can rely on the arithmetic skills they already possess when learning this introduction to algebra with variables and expressions. Students are familiar with calculating the area and perimeter of figures like the one on the left before they are introduced to variables. Later, they may see the same figure with the addition of a variable, as shown on the right. The addition of the variable will come with new instructions as well. The difficulty of problems using variables is determined by the information given in the problems. For instance, the problem on the right can be a one step equation if an area and perimeter are given so that students only need to solve for w. The difficulty can be increased by giving only a perimeter so that students must solve for w and then for the area. My colleague Jason Ermer is back from summer hiatus and has posted his fifth challenge video, shown below. In Part 6 of this series, I mentioned the following fact concerning the decimal representation of : if neither nor is a factor of , then the repeating block in the decimal representation of has a length that must be a factor of . This function is the Euler toitent function or the number of integers less than that are relatively prime with . In this post, I’d like to provide a justification for this theorem. In other words, let be the multiplicative group of numbers less than that are relatively prime with . By assumption . Then is the order of in , and there’s a theorem that states that the order of an element of a group must be a factor of the order of the group, or the number of elements in the group. In our case, the order of is the number of integers less than that are relatively prime with , or . In other words, using these ideas from group theory, we can prove that . Naturally, we don’t expect middle school students seeing long division for the first time to appreciate this property of decimal representations. Still, my main purpose in writing this post was to give a concrete example of how ideas from higher-level mathematics — like group theory — actually can shed insight into ideas that are first seen in school — even middle school. In other words, there’s a reason why UNT (and other universities) requires that college students who want to earn mathematics teaching certification with their degrees must have a major in mathematics. In Part 5 of this series, I showed that fractions of the form , , and can be converted into their decimal representations without using long division and without using a calculator. The amazing thing is that every rational number can be written in one of these three forms. 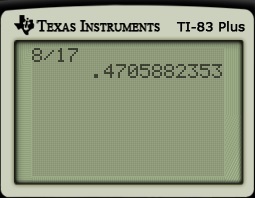 Therefore, after this conversion is made, then the decimal expansion can be found without a calculator. Case 1. If the denominator has a prime factorization of the form , then can be rewritten in the form , where . The step of multiplying both sides by is perhaps unusual, since we’re so accustomed to converting fractions into lowest terms and not making the numerators and denominators larger. This particular form of was chosen in order to get a power of in the denominator, thus facilitating the construction of the decimal expansion. Case 2. If the denominator is neither a multiple of nor , then can be rewritten in the form . This example wasn’t too difficult since we knew that . However, finding the smallest value of that works can be a difficult task requiring laborious trial and error. However, we do have a couple of theorems that can assist in finding . First, since is the length of the repeating block, we are guaranteed that must be less than the denominator since, using ordinary long division, the length of the repeating block is determined by how many steps are required until we get a remainder that was seen before. For the example above, since was prime, we have . Case 3. Suppose the prime factorization of the denominator both (1) contains and/or and also (2) another prime other than and . This is a mixture of Cases 1 and 2, and the fraction can be rewritten in the form . Next, we need to multiply by something to get a number of the form . Since is prime, every number less than is relatively prime with , so . Therefore, must be a factor of . So, must be one of , , , , , , , , and . So let’s try to find the least value of that works. If , then , and it turns out that , an integer. Students are quite accustomed to obtaining the decimal expansion of a fraction by using a calculator. Here’s an (uncommonly, I think) taught technique for converting certain fractions into a decimal expansion without using long division and without using a calculator. I’ve taught this technique to college students who want to be future high school teachers for several years, and it never fails to surprise. In other words, if , then the decimal expansion of is a repeating block of digits containing the numeral , possibly adding enough zeroes to fill all digits. The first line is obtained by multiplying the numerator and denominator by . The second line is obtained by using the formula for an infinite geometric series in reverse, so that the first term is and the common ratio is also . The third line is obtained by converting the series — including only powers of — into a decimal expansion. 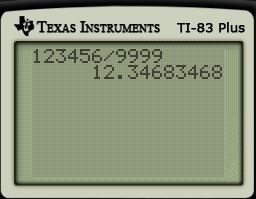 This can be confirmed with a calculator. Notice that the repeating block doesn’t quite match the digits of the numerator because of the intermediate step of applying the division algorithm. On the other hand, if , then the division algorithm must be applied as before. For example, let’s find the decimal expansion of . To begin, we need to divide the numerator by , as before. Notice that, for this example, an extra iteration of the division algorithm is needed to get a remainder less than . In particular, notice that the three s in the denominator correspond to a delay of length 3 (the digits ), while the in the denominator corresponds to the repeating block of length . These can be confirmed for students who may be reluctant to believe that decimal expansions can be found without a calculator.